The Mechatronics Alliance is a network of applied research organizations sharing expertise in view of supporting their members to innovate in preparation of the 4th industrial revolution. 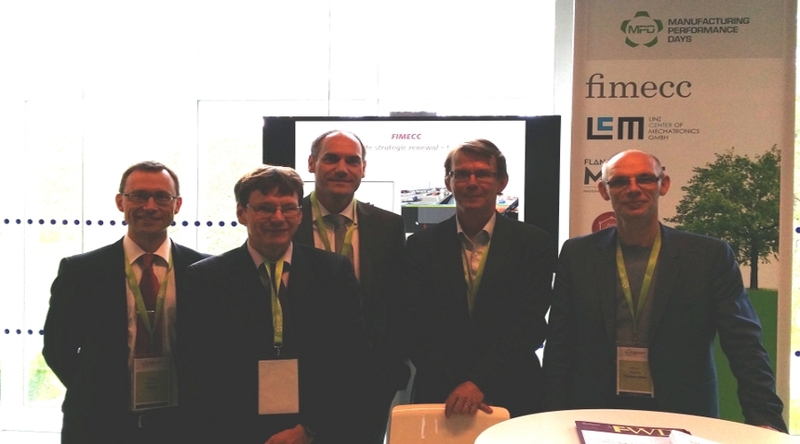 The alliance, already active in Finland, Austria and Belgium broadens its horizon, welcoming the French E-TIME Institute. Laurent Tabourot, member of the E-TIME Institute comments on their ambitions to get into the alliance: “The aim is to cooperate, share expertise and join a group, which will have a much higher potential than its simple components. Together, the Mechatronic Alliance will move on to generate innovation for the enterprise network that surrounds them”. The result is a strong research network covering 4 European countries, bringing together more than 300 companies and about 800 researchers. 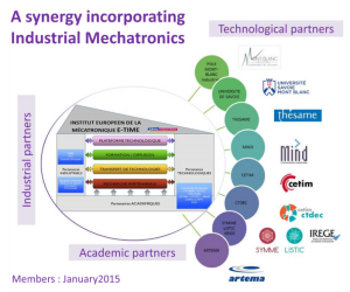 In the Mechatronics Alliance, Linz Center of Mechatronics (Austria), Flanders Make (Belgium), FIMECC (Finland), and the E-TIME Institute (France) join their knowledge and forces. Recent cooperation within the alliance included joint acquisition of knowledge on indoor localization systems, a stone detection system for harvesters, computer aided architecture design of an industrial laundry machine and control algorithms for digital hydraulics. The alliance will be participating / participated in the Manufacturing Performance Days 2015, in Finland from 8th to 10th of June. E-TIME (European Institute of Mechatronics) will offer businesses and project leaders with mechatronic skills in basic research, industrial research, experimental development as well as strategic and managerial support in innovation and the transfer of experience to achieve operational goals. This place of cross-fertilization between academic, industrial and institutional worlds aims to develop the expertise in Industrial Mechatronics. In Tampere, Finland the Mechatronics Alliance is presenting their know-how at the Manufacturing Performance Days 2015 (MPD). The MPD is a seminar for manufacturing industries, researchers and technology and service providers worldwide. This event will bring together more than 500 international experts and academia to discuss and represent industrial best practices and operational excellence, novel business concepts as well as scientific and technological breakthroughs. This year the topic of the event is, True Competiveness, which should bring answers to the questions of true competiveness and resilient manufacturing.